The Children's Food Campaign is calling on Government to 'put unhealthy foods back in their place' in its response to the Government consultation on in-store price and display promotions of unhealthy foods. Read the full response now. More than 3 in 4 (77%) of parents have overwhelmingly backed a ban on junk foods at checkouts and other prominent locations at entrances and aisle ends in a survey conducted by the Children’s Food Campaign as part of its response to the Government consultation on restricting price and location promotions of foods high in fat, salt and sugar, which closed on 6 April. 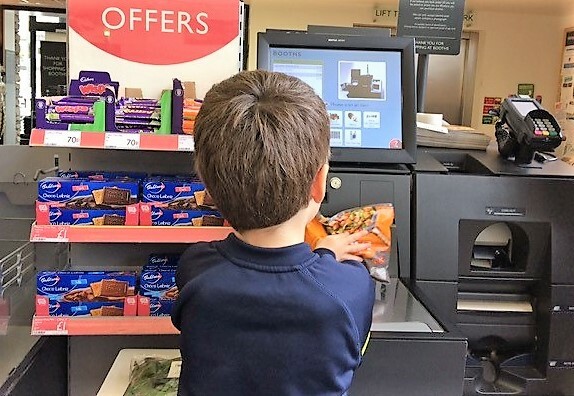 The Children’s Food Campaign also warns that restrictions should not ignore the increasing use of Free Standing Display Units (FSDUs) around shops, as well as the likelihood of mobile technology increasingly displacing checkout systems. It argues instead that products such as crisps, chocolate and other less healthy foods should be “put back in their place” so that shoppers are not constantly prompted to make unplanned unhealthy food purchases. The Children’s Food Campaign has also backed proposals to restrict multi-buy and “extra free promotions” encouraging people to trade up to larger volumes than they planned, but also warns that current trends towards temporary price promotions and £1 deals are already becoming the dominant promotional offers and should also be monitored, alongside their effect on overconsumption of sugar, salt and excess calories. The Government now has around 12 weeks to evaluate responses to the consultation and make a decision about the scope of products and promotions to be restricted. Read the full response of the Children's Food Campaign to the Government consultation. Read the 5 reasons Children’s Food Campaign member Food Active supports a ban on junk food promotions.